Quality Website Design Plymouth, Devon, Web Design and SEO | Local, Affordable, Professional web development services in South Devon and Cornwall. 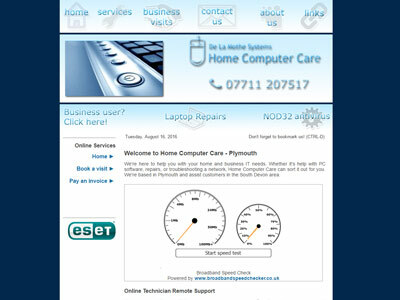 Quality Website Design is currently based in the South Hams, close to Plymouth, Tavistock, Totnes and Ivybridge, Devon. Please click on the topic on the right below to learn more about our professional web services, or click here for a quick website quotation. 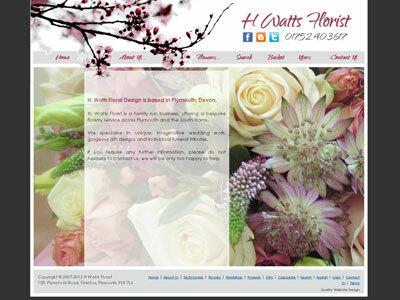 H. Watts Florist is a family run business, offering a bespoke floristry service across Plymouth and the South Hams. H. Watts Florist specialises in unique, imaginative wedding work, gorgeous gift designs and individual funeral tributes. 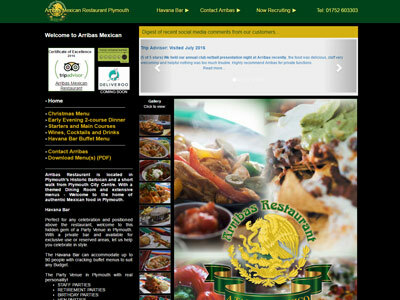 Arribas Mexican Restaurant, Plymouth - A smart and stylish main restaurant and a buzzy and popular Tequila Bar upstairs. Arribas is housed in an historic building on the famous Barbican it�s the first choice for locals and visitors alike. Buffets and large private-hire function-room available. 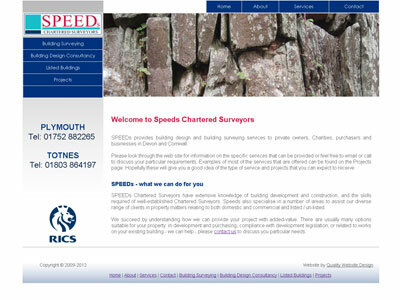 SPEEDs provides building design and building surveying services to private owners, Charities, purchasers and businesses in Devon and Cornwall. SPEEDs Chartered Surveyors have extensive knowledge of building development and construction, and the skills required of well-established Chartered Surveyors. Speeds also specialise in a number of areas to assist our diverse range of clients in property matters relating to both domestic and commericial and listed / un-listed. 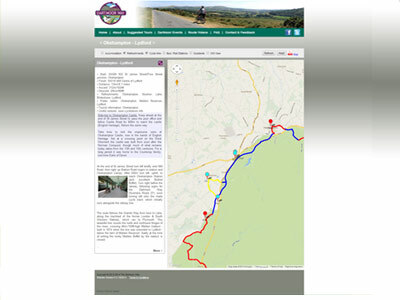 The Dartmoor Way Cycle Route is a 95 mile-long circular route which winds its way around the natural beauty of Dartmoor National Park, linking hamlets, villages and towns along its length. This recreational route takes cyclists through the varying landscape surrounding the High Moor, visiting attractive and interesting locations which offer a wide choice of places to eat, drink and stay for the night. The well-signed Dartmoor Way Cycle Route follows quiet Devon lanes and minor roads,and uses traffic-free cycle tracks wherever possible. 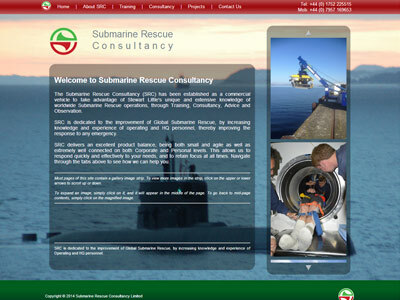 SRC is dedicated to the improvement of Global Submarine Rescue, by increasing knowledge and experience of operating and HQ personnel, thereby improving the response to any emergency. SRC delivers an excellent product balance, being both small and agile as well as extremely well connected on both Corporate and Personal levels. This allows us to respond quickly and effectively to your needs, and to retain focus at all times. Navigate through the tabs above to see how we can help you. Home Computer Care is here to help you with your home and business IT needs. Whether it's help with PC software, repairs, or troubleshooting a network, Home Computer Care can sort it out for you. We're based in Plymouth and assist customers in the South Devon area. High quality at reasonable prices! Our business helps your business with Internet Marketing: Websites, CRM technology, communications, logo and other graphic design - all with a Human Face. With many years' Internet, Software, and Business experience we can talk with you about your objectives in Plain English. Just call or email us for free, no-obligation meeting. We use large, commercial third-party registrar companies to do this. We try to find the best value offers on the domain name market and the only additional charge is for the small amount of time taken to accomplish this. Similarly, with hosting your website, we use third-party commercial servers with high degrees of availability (better than 99.7%) and with tailored levels of service and cost - from basic value hosting, right up to enterprise hosting and secure (SSL) servers. A website reflects the business that owns it both in image terms and in what job it has to do: from a simple static advertisement with a map, right up to a large web-business with online ordering and credit card payment facilities. What should my site look like? As understanding your unique requirements is paramount, we ensure that we listen to your business requirements, and your preferences. We then very rapidly create some initial ideas for discussion, and develop the favoured design to the next phase... read more. A website generally consists of "content": text, images, video etc., toegther with an interlinked page structure ideally allowing users, without any prior familiarity with the website or business to find and order items very quickly and easily - with the minimum number of mouse-clicks. Developing this content and structure is the next step. This can be done from scratch using the look and feel designs from the previous stage or, we are happy to discuss with you how you existing site can be "freshened-up". For example, by making it less cluttered, easier to use, or perhaps one of our specialities: adding facilities to allow you to modify key parts of the content yourself. Do you need to update you site regularly, e.g. for news, events, blogs, offers etc? Websites must not only be easy for Internet visitors to use, they must also potentially allow the website owners or operators to manage them easily. For example, to understand website traffic trends, and to change key content: adding latest offers, adding and deleting news items, changing prices, etc. Our aim here is to provide you with these "content management" facilities so that, rather than always having to rely on the website designer, you can be in direct control of agreed key areas or your website. Of course, we are available to help if required. We can help with all grades of website that have online selling facilities. These facilities can vary from straightforward "please call to order" pages or PayPal, or using a (email based) order form, or using a full merchant system for card payments. It really depends on the nature and state of your business which level you go for. At Quality Website Design we won't just sell you the latest all-singing all-dancing e-commerce site - as this may be totally over the top in terms of what you actually need. So we will discuss your expectations for the website, in terms of visitors, orders, order value, and the likely costs which the transactions will incur, such as online payment costs. Rapid (or timely) order fulfilment following a customer purchase is critical - the so-called "back-office" configuration. These factors and many more influence what the implementation should be, and we can discuss these with you in an independent fashion to find out what's best for you. Of course, we can help you in the evolution of your online systems so that they can grow, or change, in a timely way to match the success of your business. The key thing is that Quality Websites Design are business website engineers - we don't just install cheap packages, tailor them and pocket large fees - we work with you to help grow your Internet (and off-web) business. We can supply images - both video and photography - for specific items or areas for your site, so you need not worry about royalty payments, or dealing with multiple suppliers for your site. If you require third-party software packages or tools (for example, Excel spreadsheets) to be integrated with your site, please enquire. In addition, we can help with affiliate sites, blogs, RSS and other commercial feeds, and other web strategies - please enquire for details. We have a number of low cost search-engine optimisation packages available so that you can tailor the profile of your website on the Internet according to your company goals and budget. All our professional work comes with a certain amount of free support in the month following launch so that words or images can be tweaked once the site has gone live. Call us today for a free, no-obligation, consultation. Many people assume that once their website is launched, people from all over the world will flood in immediately and start buying things. This is the ideal. In practice, there are many billions of webpages accessible on the Internet, many competitors with established sites and large monthly budgets, so that getting strangers and real customers to visit your site (not just friends, colleagues and family) is rather like getting people to listen to you in a full Wembley stadium with a match in progress. It may be easy to chat to the person standing next to you, but what about over the other side? This is where the search engines come in, (the most popular, Google, now has around 50% of the UK search and advertising market) they act as a "public address system" in the stadium - making your voice heard far and wide. We can help with the subtle business of ensuring your site gets good air time and your website, having been published, gets noticed and attracts the right busines. It's not just a case of simply getting visitors or "hits" - the key factor is how many of these people press the "buy now" button or the "please send me more info" button. This comes down to the marketing psychology of the site and is not simply a technical or engineering issue. It depends on your products, how they are promoted, pricing etc. As business professionals, not just website designers, we can assist you with this process as well, and exploit our knowledge of the best technical ways to achieve marketing goals on your website. How much will a new or upgraded Website Cost? Quality Website Design (QWD) can quote for high-quality web design work based on hourly rates, or a fixed price for a well-defined piece of work. We've also designed some lower cost web design starter packages or projects for first-time website owners. For more tailored professional web design work, please call us on 01752 873181. Copyright © 2006-2019 Quality Wesbite Design.